Beyond belief and out of this world! 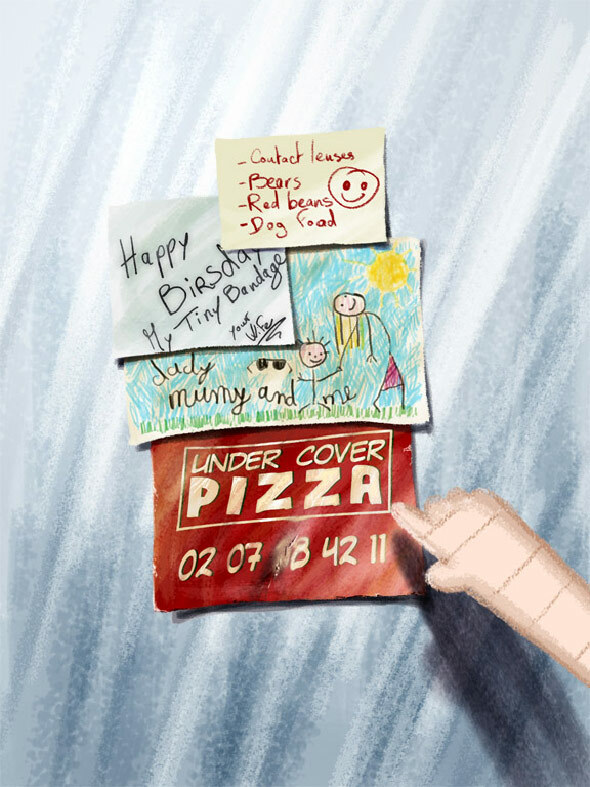 A wrong number dialed for pizza delivers espionage and the counterpoint of a booming narration along with the promise of newly rendered spills and thrills. 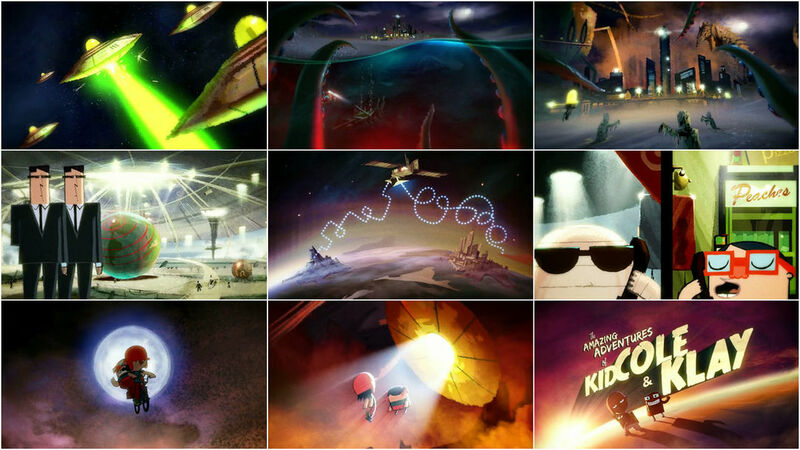 Stéphane Coëdel’s opening title sequence for The Amazing Adventures of Kid Cole & Klay gets its details right: the slow, undulating rowboat POV, a mere oar’s reach of the salivating dead in company of other emissaries of evil. See Mr. Invisible. 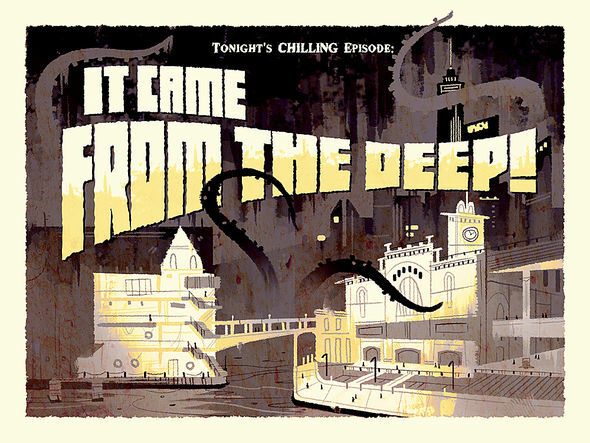 Get cozy with the title card for “Tonight’s Episode,” bathed in boggy, absinthe-impelled atmosphere featuring noxious architecture-fondling tentacles. Toe-tap to that dizzy rocket bebop beat by Ben Locket. The end of the opening sequence is thunderous paranoia foisted – “THEY HAVE TO! THEY ARE OUR ONLY HOPE!” It’s Dilbert and Doctor Who at the drive-in. A discussion with Director STÉPHANE COËDEL who began his career in Paris as a motion graphics designer, before moving to London in 2006 where he now works as a creative director/animator/compositor/sound designer. What was the impetus for the show? SC: Being huge fans of sci-fi and horror movies from the 50′s, this opening title was clearly a tribute to all those cheesy and naive visions of constant threats to humanity with stop-motion robots, actors in monster suits and model kit cities under attack. I’ve always been fascinated by hand made sfx and the little mistakes which make the whole thing feel warm. That was the main inspiration for this title. The pacing is very interesting. There is room to breathe. Did that give you more freedom with your work? It was the first time I worked with Pete Candeland (Gorillaz music videos, Rockband) When we first met, we decided what needed to be told in the open, he showed me some sketches he did to give me an idea of the kinds of scenes he had in mind. I was then free to come up with any idea. He trusted me totally. I think each of us got lucky in the way that we are both fans of this kind of quirky “sci-fi/horror” style, and I’ve been collecting soundtracks and old sci-fi art pieces and books for ages now so I had everything ready to be used. The whole process went really smoothly. I would even say it was quite easy; right team, right timing, right combination of minds and talents. Tell us about the organic elements to your process with regard to the animatics. I first came up with a rough storyboard quickly edited on a reference mix I did, using few different soundtracks from old movies and TV series (The Day the Earth Stood Still, Bernard Herrmann, Echo Four Two, Laurie Johnson and the Chips TV series by Bruce Broughton). I always choose the music before animating or editing. It helps me to make the rhythm flow, to picture what should be the final result and how to choose each element, to give more impact to the edit. After that, we sent the rough animatic as a reference to Ben Locket, the composer. 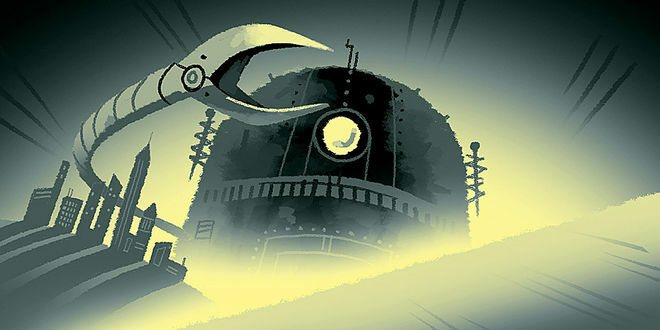 And to Kevin Dart, who started to produce some of the backgrounds and creatures. I asked him to be as free as he liked, since his style fit perfectly with the tone of the project. 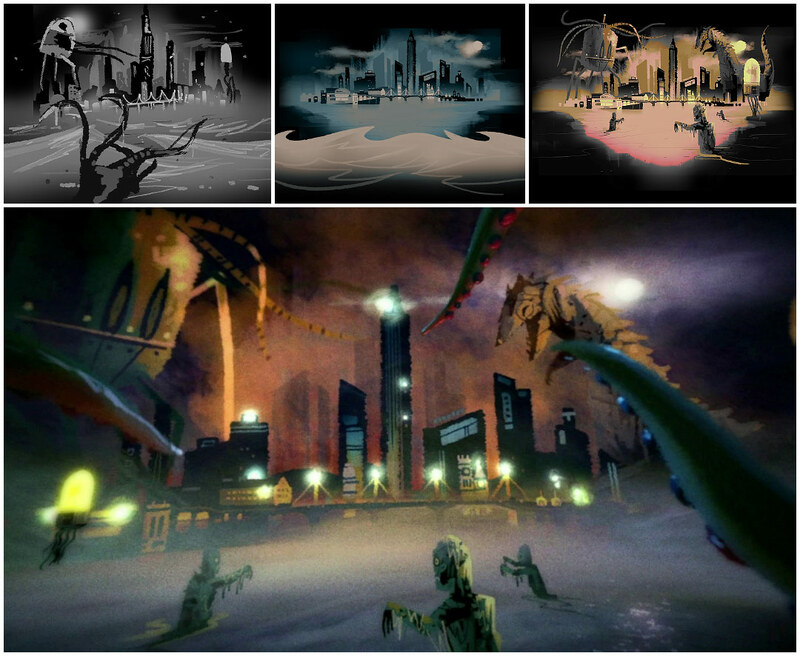 Then I produced a colorboard to decide of how the lights and colors would evolve with the music and the edit. 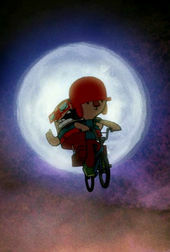 And then came the real animation and compositing process. Kevin sent me his backgrounds and monsters. I retouched them to include them in the shots (mainly adding some more color tones and cutting them out in pieces for the animation). 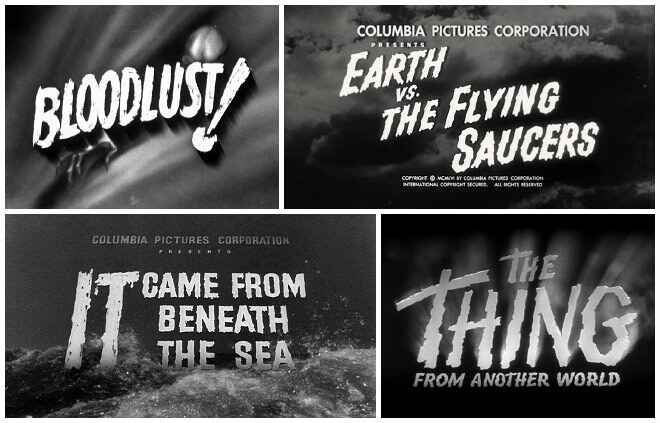 I wanted to give the audience the same feeling I had when I saw these old monster movies; the grainy picture, Ray Harryhausen style of animation for the giant killer robots and monsters. As if they were either stop-motion animated models or animatronics mixed with real footage like the smoke, the sparkles, the lights. The quirky voice over was directly inspired by one movie from the 50′s called Kronos. The aim was to make the whole thing feel not perfect, the less computerized I could, and make it feel warm. I had 5 weeks to do the whole thing. What are the chances this will ever see the light of day as an online series? I’ll assume the cancellation was excruciating -good projects die. But this is an era of desktop democratization so, as I see it, nothing worth its salt should fizzle. Do not creatives bear a greater responsibility to see the inherent good ideas through? Cartoon Network didn’t pick it, but it doesn’t mean that the project is dead especially since I put the opening titles online. The feedback from everybody is extremely positive and it makes us hopeful for a brighter future for Pete’s concept. I think he even got in touch with some people interested in his idea. So I think we can be very optimistic about it. What was it like to create something with a basis of progression and evolution and have it taken away from you? So far it has been my best professional experience. Basically I was asked to do what I love in the way I wanted it. Even though I made it to serve and advertise someone else’s concept, I consider it to be one of my most personal projects. And it was really amazing to have the chance to work with so many talented and humble people. The funny thing is that it was the first time I was working with Kevin. I was already a huge fan of his work, I just bought one of his art pieces for my brother’s Christmas gift and a week later, I got a call from Cartoon Network telling me that I would be working with someone called Kevin Dart! No need to tell you how I felt! Do you consider yourself a natural artist? How much of what you do is self-taught? I’m not sure I know what an artist is really. The only thing I’m sure of is that I always use each job as an opportunity to develop and enrich my inside world, I try as hard as I can to come up with a personal vision. I can be inspired but I always use my way to translate that inspiration into something personal. From your experience (since 1998 only! ), what is graphic design like in Paris compared to that of London? I found the gap between Paris and London really obvious on many levels. First, I left Paris because I felt my career wasn’t evolving anymore. Even though I was experienced and my qualities had improved, it seemed that no one was seeing it. I visited a few motion design companies before I moved and I have to say, it’s much harder to get to meet someone in Paris than in London! I don’t know why but they always had something else to do. I never had any problem meeting the person in charge in any of the studios I visited in London. I even got to meet the big boss sometimes. Another big difference is the trust. When I arrived here, people only saw me from my reel. I thought I would have to start over again, working as an animator in a team, but my first job was a directing job! This is extremely rare to get that kind of opportunity in Paris. Maybe because the advertising market in London is extremely dynamic compared with Paris, people are more likely to take risks. There’s an energy here that I can’t find in France, everything is pushing you up. You’re surrounded by a lot of very motivated and enthusiastic people who are all looking forward to doing great things. Animation is everywhere in London! Out of 10 advertisers, 7 are using motion graphics here. There are between 20 and 30 motion design or animation studios that are for for the most part, always busy. In Paris there’s 6 or 10 of them. I think moving to London is the best idea I ever had. I love Paris and I really want to go back there one day but it won’t happen before a while. I’m enjoying my job here so much!! I get to meet great people and talents! I’m learning so much from them! Can you give us an example of something you took away from one of your collaborative projects? Which gives you a greater satisfaction, collaboration or a project that is entirely your own? Honestly I think that so far, Kid Cole & Klay is the project that gave me the most satisfaction. Firstly, because I got to work with Pete Candeland and Kevin Dart. And as ridiculous as it can sound, it was like if I was a kid who got to be friend with Superman! Haha! I was witnessing the creative process of a TV show, I was in total control of my part of the job in the way that Pete gave me full freedom on the title. Back in France I used to be kind of a control freak, it was a bit hard for me to trust people I worked with, but on this job I was collaborating with very talented and skilled artists. So it was easy to trust them. Windsor McKay, Ray Harryhausen, Jim Henson, Michel Gondry, Rod Serling, Saul Bass, Brad Bird, Norman McLaren, Hayao Miyazaki, Satoshi Kon, Rene Laloux, Ray Bradbury, Jules Verne and many others. At the moment, I’m directing a new opening title for another pilot for Cartoon Network and at the same time, I’m co-directing a trailer with Kevin Dart for his new series of illustrations about Yuki 7 a secret female agent.